There has been increased interest in getting the two sides together in public where folks can hear a “point/counter point” style debate on the merits and pitfalls of the Common Core program. We’ve been told many times that when folks listen to the proponents speak about CC, they make sense… and when they hear the opponents speak, they make sense as well. It’s difficult for them to reconcile the very different perspectives and facts, so they have asked us if we would consider holding a public debate where we will be required to discuss the differences directly. It seems like a reasonable request to us, so we wondered whether or not you will consider putting together a small panel to “face off” with us. We’re open to it… what do you think? If you will agree to this, we can work together to set the rules for the event, as well as choosing a suitable moderator. The 9-12 Project of Idaho, Inc.
Ms. Candelaria, thank you for your email. Supt. 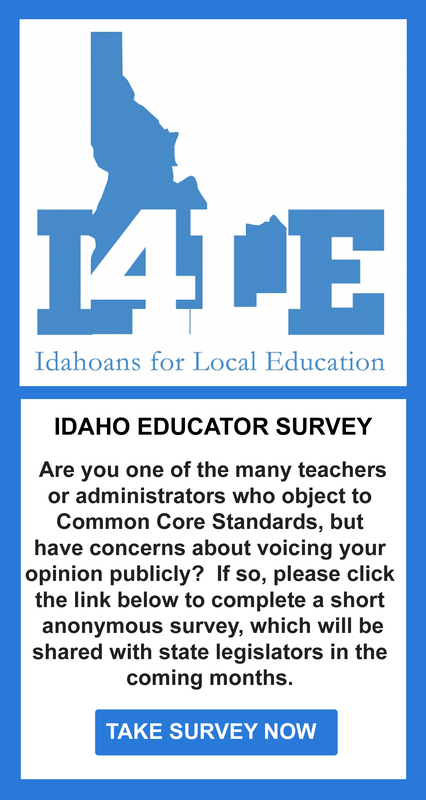 Luna has spoken to groups all across Idaho over the past several months about Idaho Core Standards. He is currently focused on implementation of the standards as delineated by the Governor’s Task Force for Improving Education, bringing higher education standards to the state. With that focus in place, he respectfully declines this invitation. Subject: Re: Possible public debate? Thank you for your prompt reply. I’m disappointed of course, but do respect his decision. Although it does bring some confusion, as I understood he was addressing a Tea Party group in Sandpoint this evening about Common Core again. Is this correct? He is speaking with the Boundary County Republican Central Committee this evening on Idaho Core Standards. It was scheduled quite a while ago to coincide with other commitments in the area and is the last in his series of meetings around the state. As the task force met across the state last year, many of the meetings were filled with comments by parents who had concerns with Common Core (or Idaho Core, as it has been re-branded). It seems these parents are going to be ignored. It’s full steam ahead for Common Core and the superintendent has decided he’s done addressing public concerns about the subject. “Respectful” declination or not, has he forgotten who he works for?